Look inside the 2017 Genesis G90 and you’ll see three rows of buttons – audio and climate controls – in the center stack. Look even closer and you’ll notice that the rows all use buttons of ever so slightly different shape. The differences allow for the varying approach angles of your hand as you reach for each level – crucial for the all-important “falls readily to hand” quotient. 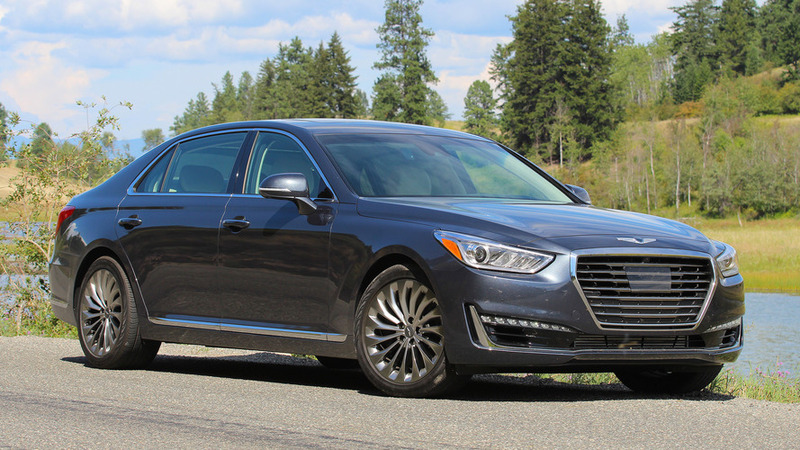 Other automakers pull similar tricks, yes, but this attention to detail is proof that Hyundai is absolutely not kidding around with the launch of both the G90 flagship and its Genesis brand as a whole. Genesis’ U.S. boss, Erwin Raphael, says it best: “This is a huge deal for us.” Genesis’, um, genesis was the original so-named Hyundai sedan that arrived in 2008. 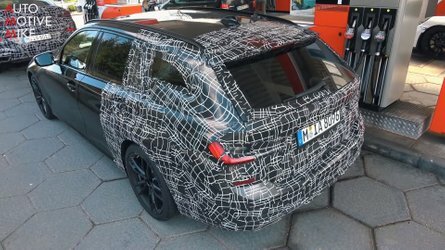 Now, years of finessing the products and closely watching the luxury space have resulted in a brand with cars that are ready for their own unique spotlight. With a focus on luxury, detail, and some impressive new bones, the flagship G90 builds a solid foundation for what’s to come. 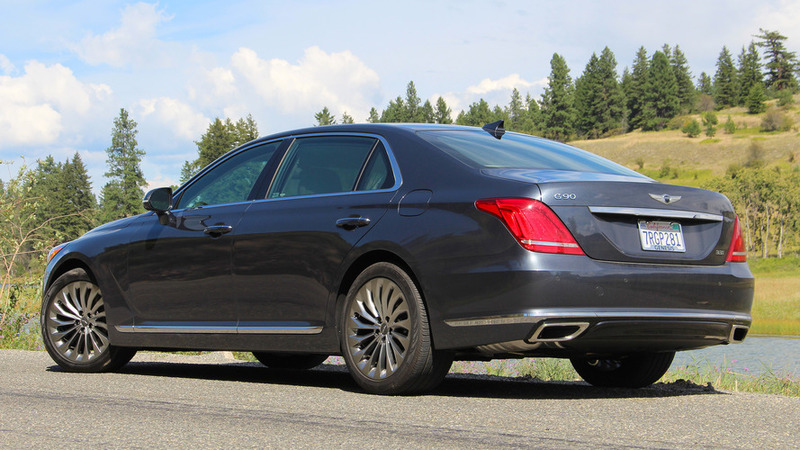 Simply put, the G90 is not a second-generation Equus. 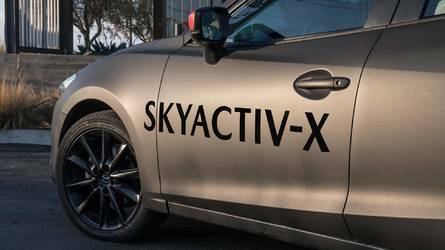 It’s a complete overhaul, with a stronger focus on good design, comfort and refinement, and significantly improved driving dynamics. 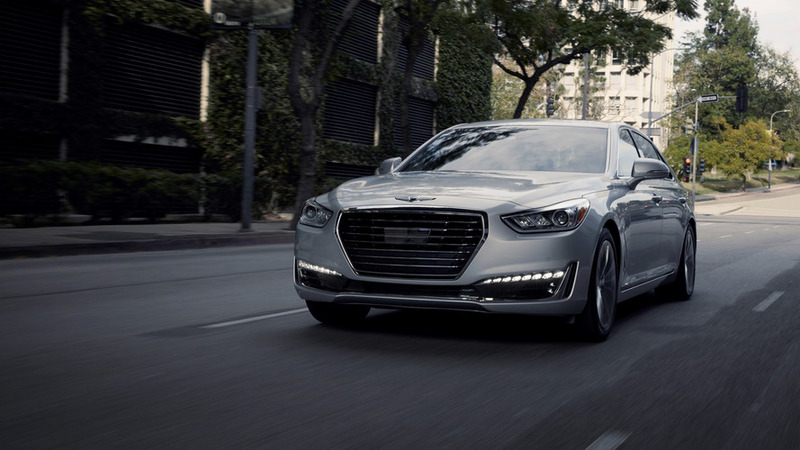 The Equus was an okay attempt at getting the Hyundai name in front of luxury car buyers; the Genesis G90 is something that’ll make people take notice. The G90 is a pretty thing to behold and looks fantastic on the road. 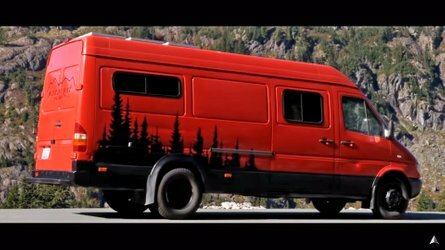 It’s a very big car with a strong design statement. 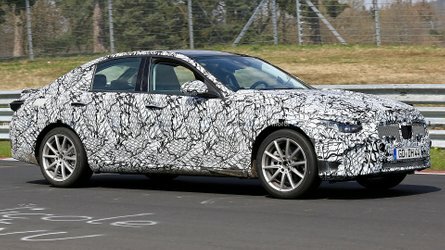 I’ll admit the front fascia and body sculpting are a little reminiscent of the Kia K900 sedan (credit to former-Kia-now-Genesis designer Peter Schreyer), not to mention the smaller G80 (the sedan currently known as Hyundai Genesis), but from all angles, the G90 is handsome and elegant, especially at the rear. Never mind the dirty car featured in my quickly snapped photos – the G90 is a pretty thing to behold and looks fantastic on the road. It has classic rear-drive proportions, its long hood and short deck accented with 19-inch wheels pushed out to all four corners. With LED lighting and tasteful bits of polished trim here and there, Genesis immediately presents itself with styling worthy of inclusion alongside brands like Audi, BMW, and Lexus. You can have the G90 with a choice of V6 or V8 power, but don’t automatically assume the bigger engine is the way to go. The six-cylinder is a biturbocharged 3.3-liter mill that’s exclusive to Genesis – executives confirmed that no powertrains or chassis will be shared between brands – with 365 horsepower and, more importantly, 376 pound-feet of torque that’s available from just 1,300 rpm. Look for this engine to spread across the Genesis range, as well – I’m excited to see how it works in smaller applications like the G80 and the forthcoming midsize G70. If V8 power is a must-have, Genesis’ 5.0-liter Tau V8 is available, with 420 hp and 383 lb-ft of torque. 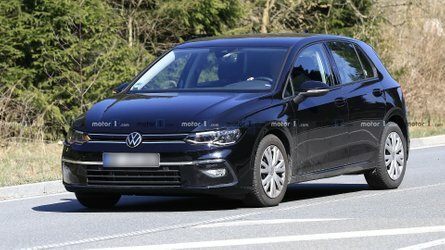 Rear-wheel drive is standard with either engine, and both can be fitted with all-wheel drive, as well. The G90’s default drive setting delivers a dynamic that’s not only significantly better than the old Equus, but feels as solid and comfortable as just about anything else in the class. With all-wheel drive and the 3.3T engine, the G90 is powerful and solid while cruising up and down the highways of my test route in British Columbia, tackling serious elevation changes with aplomb. The eight-speed automatic transmission doesn’t struggle to manage the engine’s power, and the shifts are so imperceptible that they needn’t take up more digital ink in this review. Genesis’ Intelligent Drive function houses four drive modes, selectable via a button just to the left of the shifter. Eco and Sport represent the bookends of the dynamic spectrum, with Smart mode serving as a sort of automatic setting, working with driver inputs to intensify or relax the experience as needed. The final mode, Individual, works as advertised, allowing you to manually adjust things like suspension, steering, and powertrain settings to your own liking. I’ll admit to leaving the G90 in Smart mode most of the time; a full account of handling will have to wait until I drive the car on more than just the long stretch of highway that connects Vancouver and Vernon, British Columbia. But left to its own devices on this type of smooth road with lazy bends, the G90’s default drive setting delivers a dynamic that’s not only significantly better than the old Equus, but feels as solid and comfortable as just about anything else in the class. There are a ton of lovely details spread throughout the G90’s cabin. 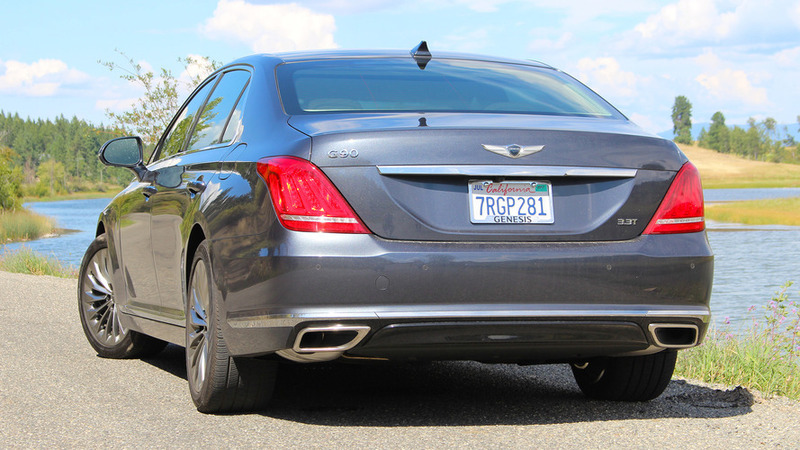 Genesis engineers are quick to point out that the G90 is actually lighter and stiffer than a Mercedes-Benz S-Class, though it doesn’t quite deliver the same Germanic solidity and smoothness out on the road. That said, credit to the team for building on the strong foundation of the G80, with nicely weighted, crisp steering; a suspension that delivers decent feedback and soaks up bumps; and a body that rolls slightly but progressively – what you expect from a big luxury barge. To put it another way, the G90 feels as good as the best American and Japanese competitors (Cadillac CT6 and Lexus LS). Again, an S-Class or BMW 7 Series still has the edge on dynamic prowess and balance, but for those, you’re paying about $20,000 more for the privilege. Going back to those audio and climate controls for a minute, there are a ton of lovely details spread throughout the G90’s cabin. I like the fact that the plastic bits on either side of the 12.3-inch high-def navigation screen are textured, for more visual interest – ditto the plastic surrounds of the seat memory controls on both passenger doors. 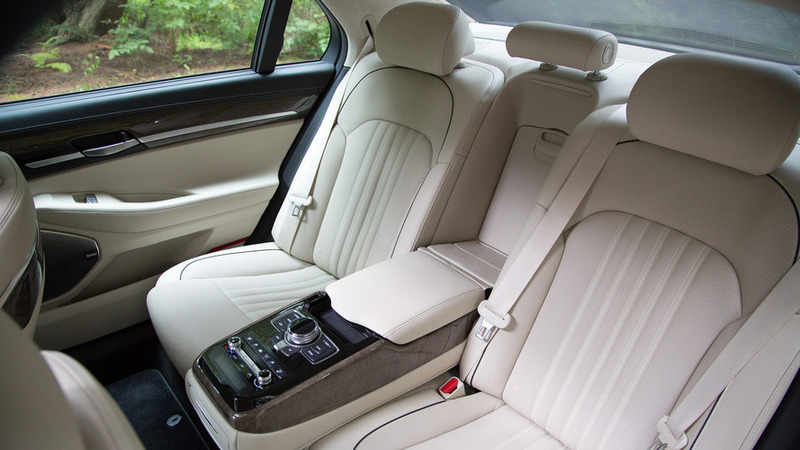 The cabin is luxurious, with nice leathers and soft touch material in abundance. Rear quarters are seriously spacious, with power seats on the 5.0 Ultimate trim, full controls for the infotainment system, and more. 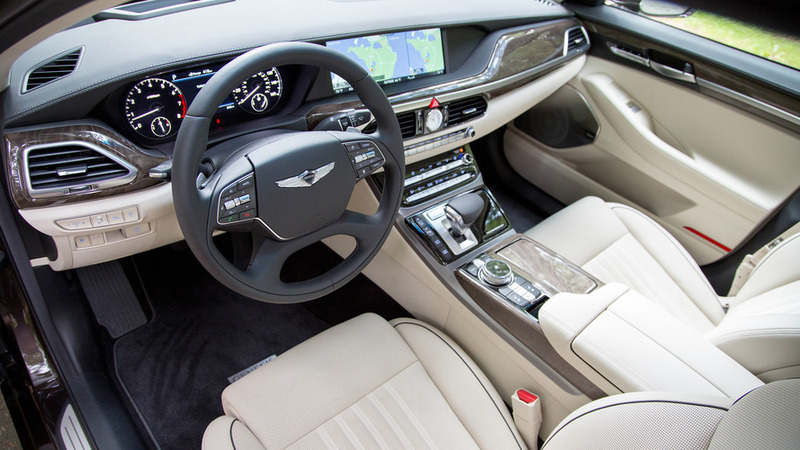 Front or rear, the G90 is a lovely space to spend time in – it’s quiet and comfortable, with every bell and whistle you could want in a luxury car. The strong attention to detail makes the G90 stand out as a proper genesis for this modern luxury brand. But there’s still a lot of Hyundai in this Genesis. Not to discredit the good switchgear and plastics of lesser cars like the Azera and Sonata, but a lot of stuff inside the G90 looks and feels familiar. The wiper and turn signal stalks, row of buttons to the left of the steering column, and even things like overhead controls and heated seat toggles are straight-up Hyundai parts bin. I’m probably over-analyzing; even with these few reminders of Genesis’ parent company, there’s nary a complaint about material quality or fit and finish inside the G90. 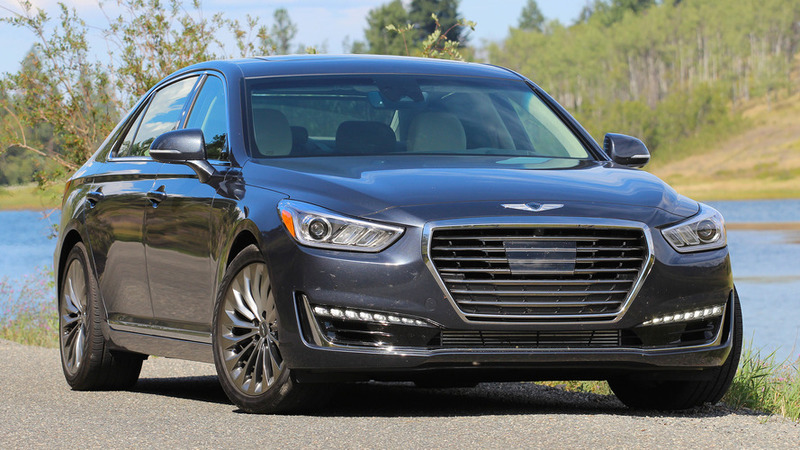 Of course, a few Hyundai parts here and there allow the G90 to arrive at a lower price point than many of its competitors – expect it to start around $62,000, though final pricing is yet to be revealed. It’ll line up very closely with the Cadillac CT6, not just in price, but in performance and luxury, too. That’s a huge step forward for the Genesis G90 – where Equus failed to capture the attention of luxury shoppers, this new sedan has a significantly better chance. You still have to walk through Hyundai showroom doors to buy it, but it’s the stronger attention to detail that makes the G90 stand out as a proper genesis for this modern luxury brand. 2017 Genesis G90 | Why Buy?